The Immel Circus is one of the most interesting “pieces” in the collection of the Massillon Museum. 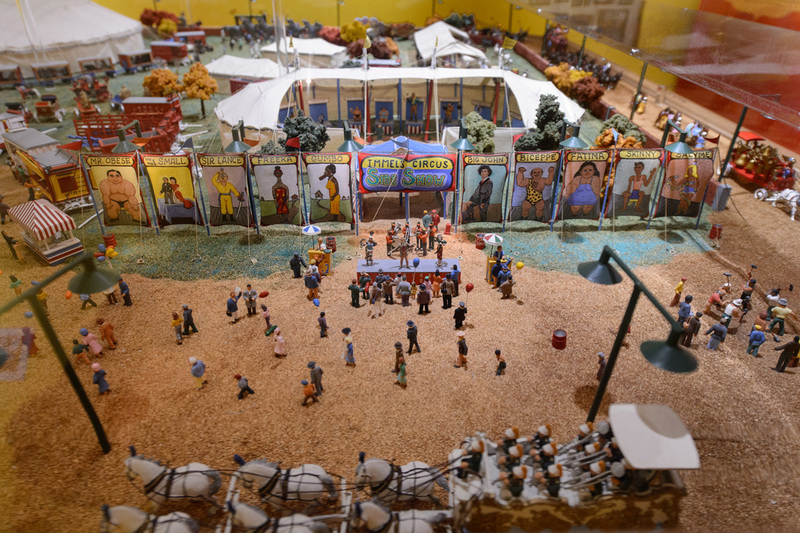 The 100-square foot miniature circus contains 2,620 pieces: thirty-six elephants, 186 horses, 102 assorted animals, ninety-one wagons, seven tents, and 2,207 people. Most of the pieces were hand-carved by Dr. Robert Immel using tools from his dental practice. Some were handcrafted by friends and retired circus performers. The Immel Circus has twice been dismantled and reconstructed: once after a fire threatened the display in the Immels’ home, and once to move it to the Massillon Museum. In 1946, Immel began his first carvings. “When I came home from the service, I had a friend…he lived across the street and was always carving things. One night he showed me what he was doing and I started. I did everything, carving to painting,” Dr. Immel recalled. “I never started out to do it,” he said of his almost fifty-year project. “I think everyone should have a hobby and should develop that interest young,” he said. The most interesting piece in the carved circus, to Dr. Immel, was the eight-horse liberty act that is located in the big top. The liberty act was aptly named because the horses were free to move about. He decided to carve the horses out of mahogany because he did not want them to break. “I started to paint them and carve them and I’d get sick. I went to the doctor and I [found that] I had an allergy.” He wanted to stay true to his vision of mahogany liberty horses so he went to the doctor’s office every Monday and Thursday morning to receive allergy shots so that he could continue his work. It took him six weeks to complete the horses. The last carving to be added to the circus is a seven-piece elephant mount. Of the hundreds of hand-carved pieces on the board, none are alike. If you have not seen all 2,620 pieces, don’t worry: it may take more than one visit. “I carved the darn thing and I still haven’t seen everything!” remarked Dr. Immel. Many adults remember visiting Dr. Immel’s dental office when they were children. After their cleaning, they were permitted to visit the hand-carved circus in the basement. 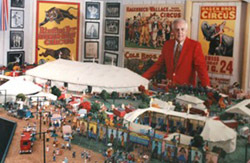 Dr. Immel donated the miniature circus to the Massillon Museum in 1995, along with more than 1,400 artifacts of circus-related memorabilia. His collection includes 115 photographs of circus sideshow acts, 559 circus letterheads, 128 books, costumes, figurines, posters, 256 circus programs, and 357 miscellaneous circus photographs. Of all the circus memorabilia, Dr. Immel favored the Tom Thumb clothing and wedding album and the gold-tipped walking stick used by P.T. Barnum. The Immel Circus is one of the few permanent displays at the Massillon Museum. It is always displayed on the second floor, along with other circus memorabilia, which rotates regularly. When he led personal tours of his circus, Dr. Immel encouraged visitors to look for hidden stories—a boy running for the restroom, a sick zebra, two performers playing checkers, and the pet monkey. 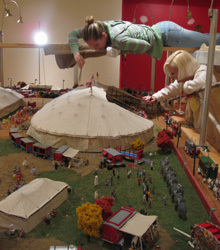 The Immel Circus is on view during regular museum hours. 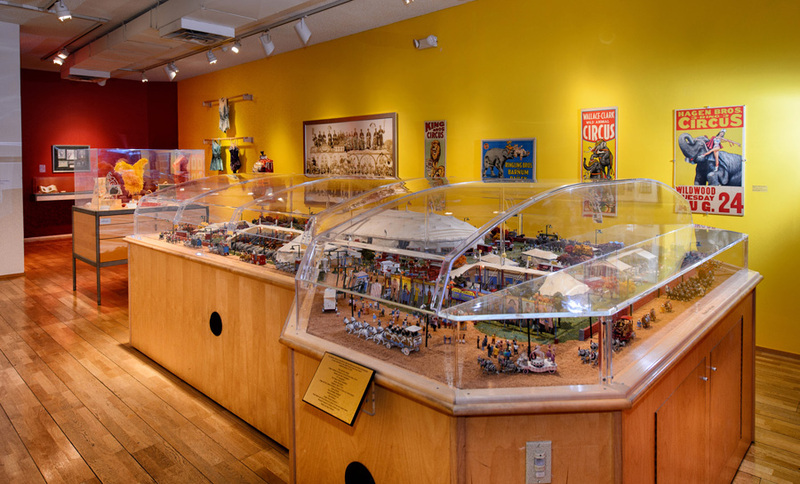 The Immel Circus collection contains more than 1,400 artifacts of circus-related memorabilia. This collection includes 115 photographs of circus sideshow acts, 559 circus letterheads, 128 books, 256 circus programs, 357 miscellaneous circus photographs, and various costumes, figurines, and posters. This collection may be accessed in the Velma B. Erwin Research Room. Click here for more information on research at the Massillon Museum. The staff of the Massillon Museum have worked hard over the past few months to do a touch-up cleaning of the Immel Circus, as George Laurence of Museum Acrylics installed the new acrylic top. This will help to protect the circus and keep the dust out for years to come. Visit your Museum today to see the results! Above: Registrar Cristina Savu poses with Bobbie Immel Muhlbach, former MassMu board member and daughter of Dr. Immel who carved the circus (2013). Below: Cristina Savu cleans the circus tents from scaffolding while Volunteer Deb Altimus cleans the thousands of circus spectators. (2010). The Massillon Museum would like to thank the following individuals and businesses for their contribution to the Immel Circus Conservation Project, completed January 23, 2013.